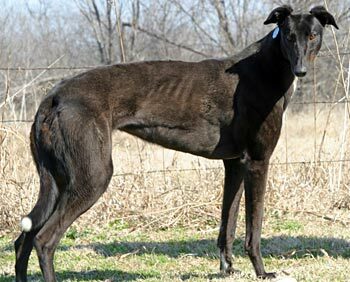 Lovely, aka RZ Lovely, is a beautiful, 2½-year-old black female born September 19, 2007. Her sire is Trent Lee, and her dam is RZ Sally Lee, making her sibling GALT's own Pete. Lovely did not show promise at the race track arena, but she sure does in the companion pet arena! Lovely is not cat tolerant. She will be tested with small animals at a later time. LOVELY: Definition: Delightful for beauty, harmony, grace. Lovely is definitely a delightful beauty. She is a young, happy greyhound with a very refreshing spring in her step and the most loving personality. She is a clear reflection of her name. Here are some observations I have made about this incredible greyhound: She is happy to be in the company of any family member; she displays perfect house manners (no accidents inside the home); she loves to go outside for walks; she plays well with and is very respectful of other greyhounds (I have Sandra Lee, who is Lovely’s half sister – they actually look like twins and are greyt together! 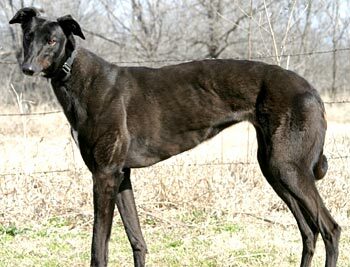 ); she does not counter surf; she takes direction perfectly and waits patiently at meal time; she enjoys dog chew treats; she gives countless kisses all day long, greats you happily at the door, her tail wags with so much appreciation; and she sleeps quietly on a big soft blanket beside our greyhound, each night. 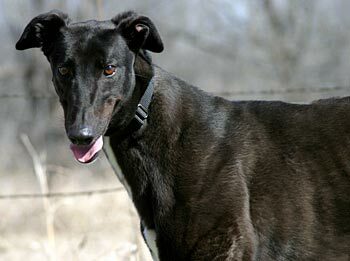 I can honestly say that who ever adopts this precious greyhound will understand why these are beloved dogs. Lovely deserves all the praise and a home she can call her own.